Customers can choose to donate to the Ending Homelessness Program or to the Evidence Testing Grant Program (HB 4102) at time of registration or renewal. This plate displays the words “Package Delivery” and requires a $25 annual plate fee and other applicable fees. 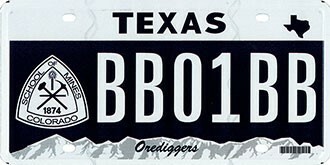 A United States Department of Transportation (US DOT) number is required for the initial issuance of the license plate. The US DOT number is alpha numeric and has 8-10 characters. Vehicles with Package Delivery License Plates will receive an annual registration renewal notice and can renew at the county, online through the Internet Vehicle Title and Registration Service, and by mail. Vehicles with Package Delivery License Plates are exempt vehicle inspection. Search by Owner If a record is not found in the Active records RTS, users can now search on owner information from Inactive and Archived records. Antique license plates with pre-printed expiration dates of March will no longer be issued. With this release, Antique plates will be manufactured on demand, and registration will be staggered for 60 months from the date of issuance. A speciality plate insignia will be issued displaying the same plate number that has been assigned in RTS, and the receipt will include the plate sticker. Before a new staggered Antique License Plate can be issued, a special plate record must be created. With this release the Antique Truck registration class has been added. For existing trucks registered as Antique, the registration class for the vehicle record must be updated to reflect the Antique Truck. With the 8.10 release that was deployed August 27, 2017, changes were made to the following annual plates by removing the Month/Year block from the license plate. As a reminder, a windshield or plate sticker will be included on the receipt. The following specialty plates are available as of November 19, 2017, and their images can be viewed at http://www.txdmv.gov/motorists/license-plates/specialty-license-plates. The Eastern Star, Ducks Unlimited (Three Dogs), Colorado School of Mines, and Carbon Fiber plates can be ordered at the county or online. 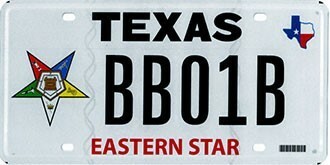 Eastern Star: A new Eastern Star specialty plate is available. It can be ordered for passenger vehicles, trucks, motorcycles, mopeds, and trailers. 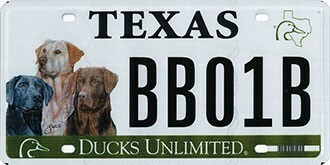 Ducks Unlimited: A new Ducks Unlimited (Three Dogs) specialty plate is available. 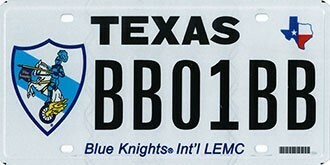 It can be ordered for passenger vehicles, trucks, motorcycles, mopeds and trailers..
Blue Knights: A new Blue Knights specialty plate is available. Members of the Blue Knights motorcycle club must certify that they are members by certifying on Form VTR-415. This plate will not be available to order online. It can be ordered for passenger vehicles, trucks, motorcycles, and mopeds. Colorado School of Mines: A new Colorado School of Mines specialty plate is available via My Plates. It can be ordered for passenger vehicles, trucks, motorcycles, mopeds and trailers. Carbon Fiber: A new Carbon Fiber specialty plate is available via My Plates. It can be ordered for passenger vehicles, trucks, motorcycles, mopeds and trailers.